For drums/percussion, I prefer the "punch" to be in the middle. So the 'flattened' curve seems to work best for that. I've noticed that when I play one of the drum loops supplied with eigenD (Factory Setup and settings) directly through the Drummer, it sounds flat (no body or resonance). The same loop played through Reaper or Studio Pro sounds full and rich. All are being played dry (no effects) through studio monitors. Has anyone else noticed this? 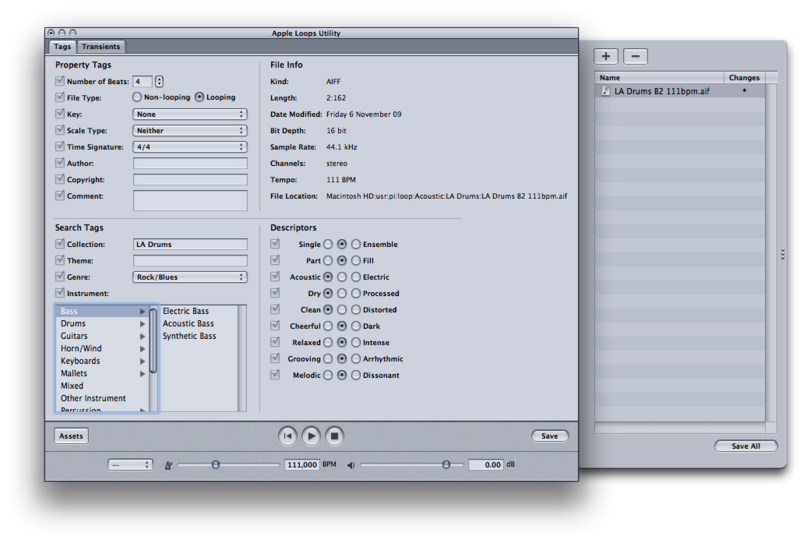 I've even tried other .aiff loops with eigenD and DAWs with the same results. Are the gains roughly the same? I find that often a track is perceived as sounding better when it is just played louder - maybe something is reducing the gain of the loops through eigenD? Maybe it's to do with the time stretching algorithm in eigenD - are you playing them at the same bpm? Same tempo and same gain. I even turned down gain the DAWs and the loops still sounded better. Maybe it's something specific to the Windows version of eigenD? We've just done some tests here to check this and we can't find any difference unless the loop is being timestretched, in which cases there is a subtle diffference but our crossfade rule (the power law used in the crossfade between segments when stretching) actually seem to sound a little punchier than Apple's, though not by much. I think Geert may post his test results in a bit, he's recorded the difference. If you play the loop back at it's native tempo then we can't find any difference at all. I suspect that you're hearing a small volume difference. It's very easy to get misled by minor volume variations (it's happened to me more times than I can think of) and really hard to avoid as listening doesn't actually reveal the volume change as a perceived loundness difference, it often manifests by the slightly louder sound seeming punchier, or just 'better'. This is a well known phenomomenon in sound engineering and often used to good effect with clients who complain a mix isn't punchy enough, one just adds a fraction of a db in volume while twiddling some other random knob, it often works very well. It's still possible that you have a real effect of some sort - we take this sort of thing seriously and if you continue to experience it we will look into it further, but our investigation this morning hasn't found anything when volume is carefully adjusted to be equal. I suspect that you're hearing the effect of different pan laws that are being used in the console mixer of EigenD. By default this is a linear curve in the console mixer, which results into -6db reduction in the center. 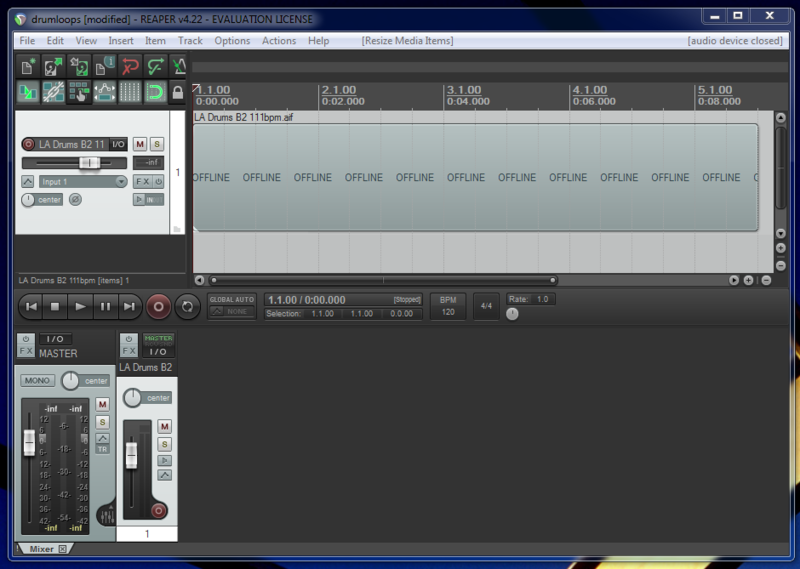 However since the mixer operates in two stages (channel and master), this is actually doubled. This provides quite a bit of headroom to prevent digital clipping, which is needed when playing lots of loops, recording and instruments together. 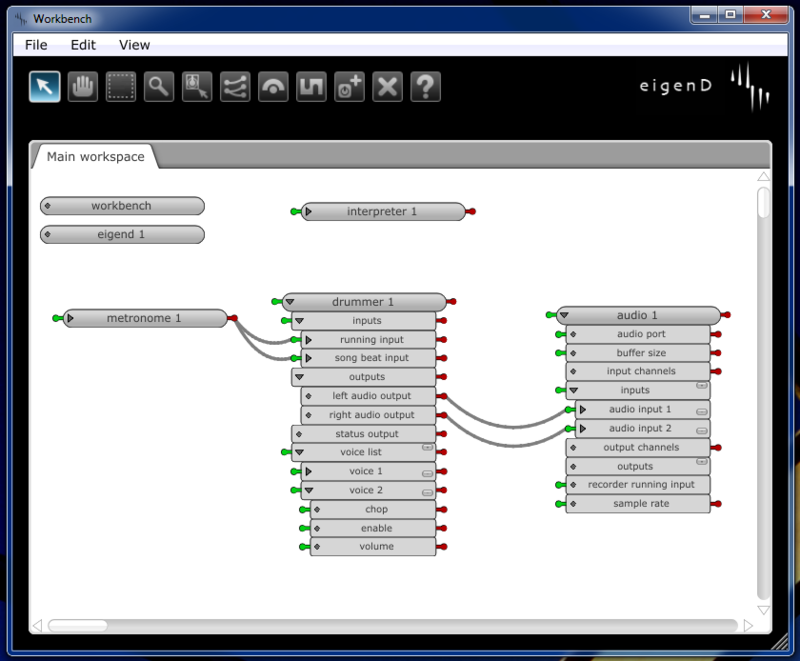 This can be changed by selecting another value for the 'pan curve' in the console mixer agent though. I tested the playback of the 'LA Drums B2 111bpm' loop in the drummer at its native tempo by wiring the drummer directly to the audio agent (see screenshot). This plays the audio back at unity gain without any intermediate stages. I then opened the same loop file in the official Apple Loops Utility and in Reaper by looping the segment (Apple Loops Utility screenshot Reaper screenshot). Note that the Reaper test isn't actually totally correct since it uses the AIFF file as straight audio without using the transients to tempo stretch when the tempo has to change. I'm curious if you can spot the differences between the sections. There are eight recordings of the loop in each file, four of EigenD and four of Apple Loops Utility/Reaper. FWIW, I think Yamaha mixers (and most others) compromise to about 3DB in the center. It would also be interesting to null out (match the transients and mix the two outputs out of phase). Initially I thought that null tests would be meaningless but given your interest Mike, I got too curious and delved in just for fun. Here's a zip archive I prepared that contains a Reaper project (DAW can be freely downloaded and tried from http://www.reaper.fm) with associated audio files. These are the original AIFF loop and the Mac audio recording I posted before. I aligned each track sample-precise on the first very spiky transient with a marker that's named 'Sample Sync Point' in the project. Before continuing, you might have to Reaper's Options menu, select Preferences and choose the audio interface you want to work with. So this clearly demonstrates that EigenD actually behaves very well and plays back the loop perfectly correctly. Thanks, John and Geert. I'll double-check my settings. That must be where the problem lies. When I dropped the gain down to -12db in Reaper, it matches the volume and quality of the audio coming out of eigenD with the Drummer and Console Mixer set to 100. I understand the compromise that was made some time ago when you dropped the default gain settings to 100 to reduce clipping. But I wonder if there might be a need to improve eigenD's audio handling? DAWs seem to be able to handle initial higher gains even when playing multiple tracks. To match volume and quality of the DAW playing at it's default mixer level (0.00dB) with eigenD at it's default setting, I have to double the gain setting of my computer's audio. Randy, as I mentioned above, you can change the console mixer's pan curve to a flattened curve which has no attenuation at all in the center. There are a series of pan curves to choose from, pick the one that suits you best. I think that there are even a series of factory scripts included in EigenD that allow you to change the pan curve in 1.4. I can't check right now though, I'm not in front of my computer. Yes Geert you are more then correct about scrips in 1.4 for changing the pan curve. It was late yesterday, so I did not put a post about it, but I was going to mention just that! change the pan curve that suits for each situation! As always, very thorough thought underlies all things Eigenharp!! FYI, when channels are hard panned left and right, like with stereo instruments, any of the 'flattened' will do. However, when you pan in between, the curves give a totally different stereo image. I personally prefer the 'square root' variants.